For baseball fans, there is possibly no greater feeling than watching a young prospect evolve from a Minor League star into a Major League stud. Atlanta Braves got to see that with Jason Heyward. Washington Nationals fans got to see that with Bryce Harper and Stephen Strasburg. And now, it seems like the Phillies are seeing that with Domonic Brown, as the former top prospect is tearing through the Grapefruit League with reckless abandon. Following Tuesday's game against the New York Yankees, where he blasted his sixth homer of the spring, Brown is 8th among all MLB players with a 1.179 OPS, and first in home runs, where he is tied with Seattle's Michael Morse. To put it plainly: Domonic Brown is absolutely crushing it this spring. Now, we all know how useless spring stats can be, because they are essentially nine inning practice sessions against weak pitching. But, that doesn't mean that they are totally useless. After all, Brown's hot spring more or less won him the starting RF job (even though it never should have been a competition), while Darin Ruf's poor spring is likely to cost him a job. They aren't the be-all, end-all, but it's foolish to think that they are totally without merit. That said, Dom's transformation into a monster in the batter's box likely didn't happen by accident. While there are some guys who are having great springs who might not even be on a big league team in July, I really don't think that Brown is one of them. The reason for that is because Brown is a legitimately talented hitter who has not had the time to impress at the Major League level. Add to that a broken hamate bone before the 2011 season, and you've got a hitter with very little exposure to big league pitching coming off an injury that takes a good year or so to fully rebound from. On top of Brown being healthy, he's also clearly made some adjustments. There was this joke among bloggers and on Twitter about Brown during the 2011 season, when the focus was on his hands being held too high when he was in the batter's box. I have to laugh about that now, because it's pretty clear that his hands are a lot lower this spring, as evidence by this batting stance comparison by by friend and fellow blogger Paul Boye (follow him @phrontiersman and check him out over at Crashburn Alley). 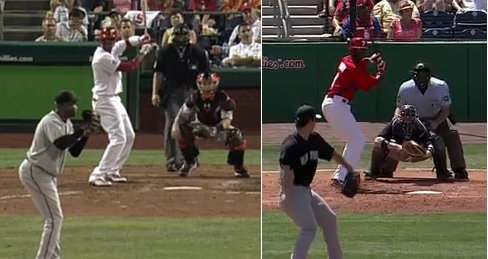 His swing now, as opposed to 2010, '11, or '12, is a lot shorter, a lot quicker, and is generating a ton of power. While his swing used to evoke Ryan Howard and his long bat path, it now looks a bit more like Chase Utley's: short, quick, and powerful. Then you have the fact that the Phillies new hitting coach, Wally Joyner, has apparently had a profound impact on the 25-year-old. Matt Gelb of the Philadelphia Inquirer wrote about this back in February, but Brown and Joyner seemed to have formed some kind of connection pretty early on in the spring after they made a few adjustments to his swing. Whatever they did, it worked, because Brown is a one-man wrecking crew out there. Of course, none of this means anything at all if Brown can't perform during the regular season. I think we can all agree that he's not been terribly impressive at the Major League level so far, but that's got more to do with a lack of playing time and a hand injury than anything else. Still it's crucial for him to keep this up once the games start to mean something. An 1.100 OPS in March is awesome, yes, but only if it means that April success is not far behind.